I'm happy to hear that the outing is enjoyed by all. But I have to say that all the credit goes to Dave. He took the time and put together the whole outing, I just supplied the outing photos, that was the easy part. He Did and awsome job with the photos they actually look better in the game, lol. I really like the challenge mode outing. Really love the idea of the monster fish swimming the shallow depth of the river waiting to pounce on a helpless fly bouncing bottom or flowting down river. Alos a pleasure to have first in an outing this fine looking dinosaur fish that I'm sure will be a challenge to catch. fishings like a box of chocolates, you never know what your gonna get. Thanks for a great outing. finally got to fish it. Sure beats to have real salmonids to work on rather than the Carp , Near Carp and other oversized Gold fish. Around here we rake them in to trash any way we can. In fact they rotenoned Lake Davis a again to get rid of that. Salmonids and Bass, ok maybe Bluegill and Crappie too. Xavier Molina AKA "The Carp Hunter"
I believe I had 2 of them on--briefly! They were at the bottom of my screen and I saw them when I hooked them! The first one snapped off immediately and the second one took all of my line, and after awhile, all of my backing and then snapped off! I had an 0X tippet on! At the rate of speed at which he was running--he should be at your house by now! I actually saw one surface once, very near the bottom of the screen, huge thing... right after that i got a hit, but was just a salmon. Have yet to hook one of these brutes. Sounds like caviar flies or maybe cheese balls will get one. EHHHMMM?? Put some cheeseballs in front of my nose and you get a hit too, hehehe! I've finally seen one of the BIG fish in this river... Couldn't hook it though. 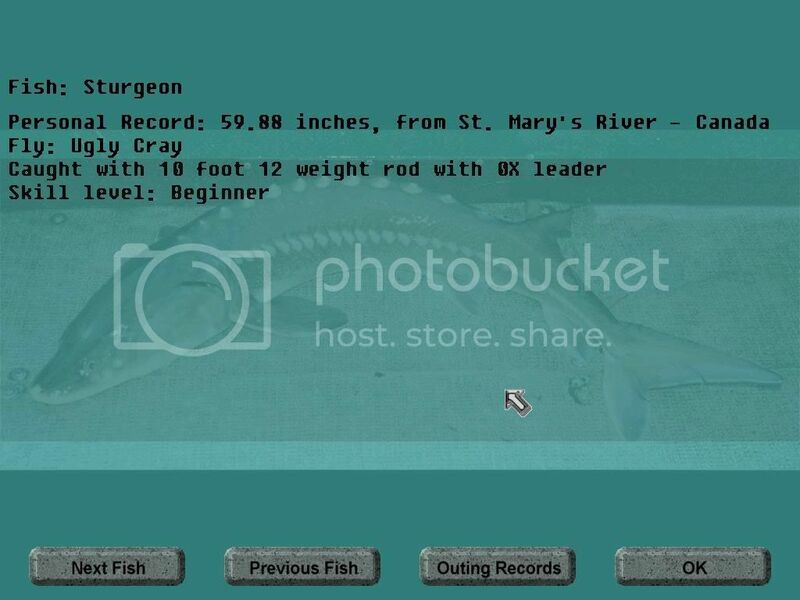 We don't see very many Sturgeon in Maine (rarely one gets caught near the coast, but it's illegal to even take it out of the water), so I'm sure I'm not using the right gear... I would think they eat shrimp, and crayfish. Anything anyone can tell me about these fish? It's very cool that you included them in this outing. As always, a big thanks to the creators who spent their time to make such a unique outing. The worst day fishing's better then the best day working... But I'd rather have good days fishing. I'll share what little I know (which may just be fishing stories). My understanding is that they are prehistoric, or at least post-prehistoric. Either way, they've been around a very long time. They are very adapatible fish. Prior to the damming of rivers, they acted similar to salminoid species - Living in the Oceans and spawing in rivers, some quite far inland. They are also know to follow other species into the rivers systems. Although there are resident fish here in Oregon in the Columbia and Willamette Rivers, more fish show up when the Shad are running in to spawn. They are almost exclusively bottom feeders. In the Pacific Northwest, anglers are allowed to keep one fish between the lengths of 39-60 inches (or something like that). Those smaller and larger are to be released unharmed. Those regulations apply only to fish that are free to return to the Ocean. 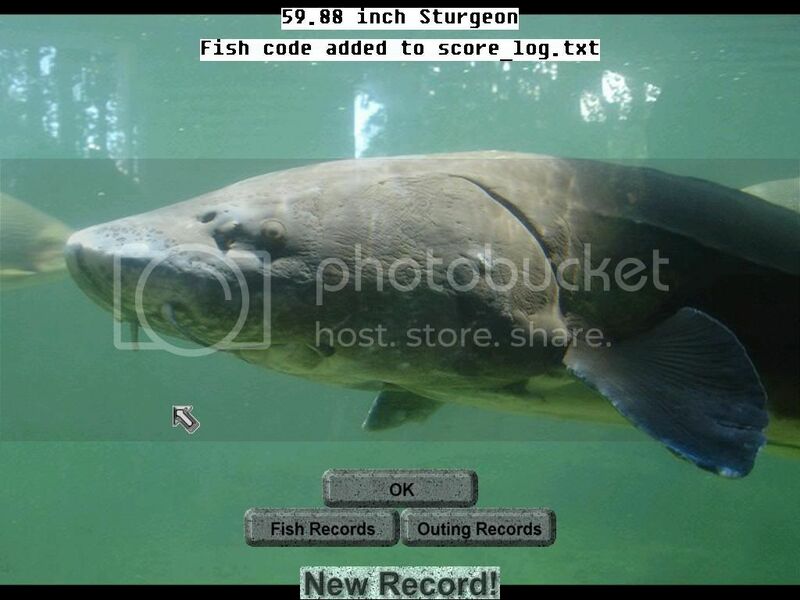 Landlocked sturgeon (behind dams) are not to be taken out of the water if caught and NONE can be kept legally. I've only caught Columbia River sturgeon from a boat, using short - stalky poles on 80 lb test, using herring or shad for bait. The common practice is to anchor in 60-80 ft of water and drop your line to the bottom. Once you hook a big one, cut loose from your anchor (attached to a big ball float) and start the fight. The big ones just pull you around the river until tired. It is quite a thrill when they jump and you realize that you are connected to something bigger than you are, or even bigger than your boat is! I have never been fortunate enough to catch a keeper, but have caught many "shakers" (small ones around 20" inches or so) and I have also caught monsters (8-12 feet). They are very good to eat - my father-in-law landed a keeper this past summer. The old timers where I grew up told stories of landing big fish with Model A's or teams of horses. There are pictures in the museum of my home town of fish in the 14-16 ft range. A fish that big is over 100 years old and weighs around 800 lbs. That was before the dams went in though. I've never heard of one taking a fly though, but since Dan said they were present in the St. Mary, I was very happy to make the species and put some in. Paul helped me make them nearly impossible to catch. They are in there mostly for visual effect as they will sometimes inhabit shallow water and can be seen passing through areas. They are also known to rise to the surface, I think just to look around. so this one does not count - it was on beginner´s level - but it WAS A GREAT FIGHT! "The first person to hook and land the new species will win a prize, just be the first to send your fish code via PM or via email to dcarp@wvi.com "